The lodge is located at the beginning of the escarpment, about 22km from Debark which is the 'frontier town' of the Simien Mountain National Park. Entrance tickets to the park are purchased at the park office in Debark. The park gate itself is at Sawre, about 16km from Debark and then the Lodge is another 6km past this gate where the scenery really opens out. The escarpment starts around the location of Simien Lodge. From Debark town to the escarpment is largely farmland. Note that the park is open from 6am to 6pm. Sometimes it is possible to get an extension to these times but not always. So it is important to arrive before nighfall. 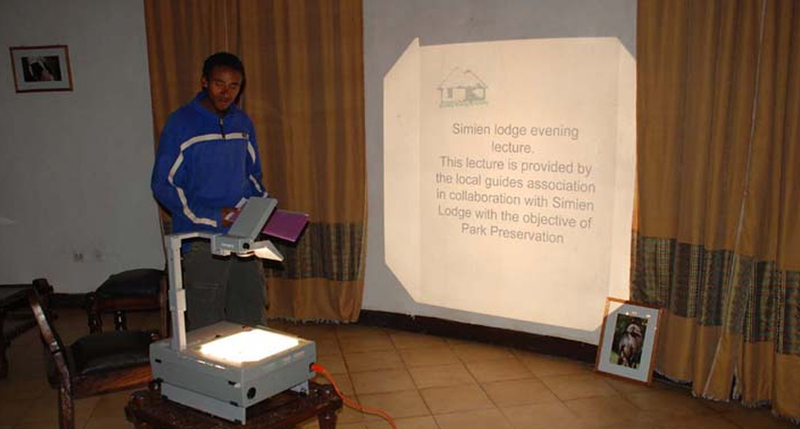 Simien Lodge cannot be held responsible for late arrivals and entry refusal by the park staff. Payments will not be refunded under these circumstances. The temperature in the Simiens varies tremendously between night and day and also depending on what altitude you are at. 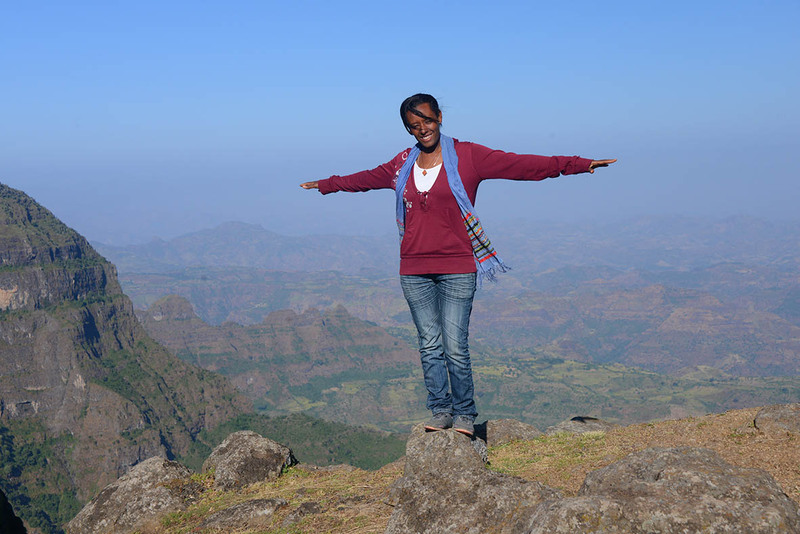 The higher you are in the Simien Mountains the colder it tends to be. In the day it tends to be quite hot with a very powerful sun and at night, as soon as the sun dips behind the mountains the temperature drops dramatically and may well drop below freezing at Gich and above (and even below sometimes). Hypothermia at night is a real possibility for trekkers who have the wrong equipment. Between October and May the likelihood of rain is very slim, as it is the Simien Mountains dry season, but even in October and May it may be worthwhile bringing a waterproof jacket just in case, because when it rains it pours! December and January are the coldest months when the sky is clearest at night. The real rainy season is July and August but even then it does not rain all the time. 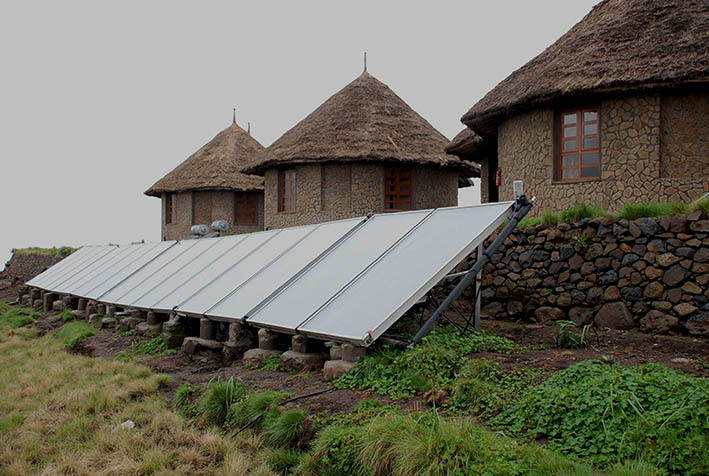 In the lodge, we have under floor heating by solar panels. Hot water is pumped under the lodge floor during the day. This only raises the temperature a few degrees; it is not a European central heating system and of course it does not work during the rainy season (photo). The Simiens are cold at night. Always bring warm clothing. (Approximate exchange rate US$ = 21 birr). Note that these fees are charged in Debarak at the park office and are not fixed by Simien Lodge. The park authority have two distinct groups; scouts and guides. Scouts are local men. Guides are more educated people who have knowledge of the fauna and flora and who speak English. At present it is a park rule that a scout has to go with the group into the park. The reason is as much to make local employment than for your safety because it is difficult to get lost in the Simiens and the trek is very secure. There is no danger from wild animals in the park. The carrying of guns by the scouts is a throwback to the early days when they looked to other African parks. Consequently Scouts do carry guns (kalashnikoffs) which may disturb some tourists. Professionals in the tourist industry work hard to dispell the myth of a land of war and famine so this is a contradiction. If you don't like the gun then just ask the scout to keep a discrete distance. However these guys are very friendly and they can provide good information through an interepreter because their english is poor. Historically it was not essential to take a guide although your trip will be more informative if you do. It is always best just to book at the park office in Debarak. Never be duped by offers of good equipment either in Gonder or elsewhere. Only sign contracts at the park office in Debarak. There are a couple of lady guides (photo) who are very popular with tourists. We can provide guides at the lodge but not scouts who are hired when you pay the park entrance fee in Debarak. There is a rota and this is in the charge of the guides association. Your guide & scout will be engaged according to the rota system. When it rains, it is best to have a four wheel drive car although the road is passable for two wheel drive vehicles in the dry season. Note that Coaster buses now struggle all year round. Driving between sunset and sunrise is not allowed in the park. Occasionally we can organise a car for you in Gonder and driver which will stay with you while in the Simiens. 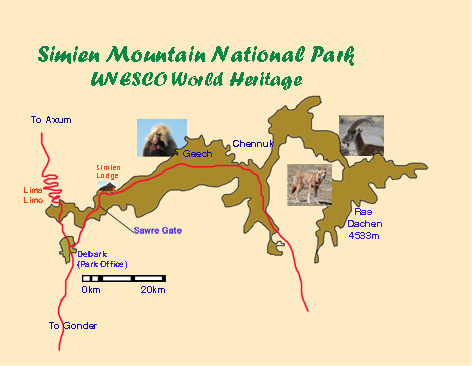 This is a good solution since you may want to trek deep into the Simiens and have the car bring you back along the vehicle track which could save the walk back along much the same route (the Simiens are a long escarpment). Please drive slowly in the park. The tour buses drive much too fast at the moment. They are often on a tight schedule and the lack of good accommodation up until now has resulted in speeding to get out of the park before sunset. If you arrive by car, tell your driver to drive slowly along the escarpment. Fast driving only makes the animals flee and this spoils things for everyone. Don't be afraid to comment to your guide. Don't let your driver rush your trip; he has seen it all before and his interest is often to get back home as soon as possible. The animals in the park are not dangerous. There are leopard and hyena but you will be lucky to see them and they will avoid you. If you are walking, they will see and hear you ten minutes before you see them. There are hamadryas baboons in the lowland area but don't go near them. They are aggressive if cornered. You should be able to see ibex, kipspinger, jackals and foxes. You can walk amongst a pack of jackals at night. They are not dangerous. There are no snakes; it is too cold for reptiles. The gelada monkey (they are not baboons which is a different genus) can often be seen right outside your door in the morning. Their safe distance is 10 meters which is the distance they use to flee from predators. Please do not feed the gelada. The first dumb tourist who does this will spoil things for future tourists! Gelada are highly intelligent. How to take great photos: Spread out when approaching gelada. Make some gentle noises so they know where you are. Don't look at them in the eye which is a sign of attack for a gelada, especially the males. Approach sideways. Don't rush at them in groups. You should be able to get within 2 meters of them if you go about it the right way and you will get some great pictures. Most nights we do a slide show in the lodge with information about the Gelada. It is very scientific and informative and adds to the enjoyment of viewing the animals. There are often research projects going on in the Simiens with teams from the University of Michigan. If you see them, don't rush up to say hello. They have probably been there since 6am and are waiting to get the right picture or an audio recording. You could spoil a whole morning's work. If you are in a car, ask the driver to turn the engine off. Both are a very real problem if you do not take precautions. The lodge is at 3300 meters, the highest in Africa. It is best to acclimatise for several days in Ethiopia above 2000 meters before coming to the Simiens. Altitude sickness makes you feel terrible and will spoil your stay. The only remedy is to descend to Debark and sleep. Drink lots of water before you come up to the lodge and don't dehydrate when in the mountains. However few people get altitude sickness. We have had guests aged in their eighties and nineties stay at the lodge. Only those people who have come straight from sea level are at risk. Sunstroke is more of a problem. Be sure to bring a hat. Rats are common in the Simiens and are the natural prey of the jackals and foxes. They are not suburban sewer rats. There is no foreign food available in Debark or the Simiens apart from at the lodge. In Debark the food is limited. Bread is available from a bakery. Otherwise it is generally Ethiopian enjera and wot. We will accept US dollars, UK Pounds, Euros and Ethiopian Birr. Simien Lodge accept credit card payments in our Addis office but not at the lodge (modem connection to banks required). There are now many ATM machines in the main towns, including in Debark, the frontier town of the Simiens. Bring cash with you for payment for souvenirs and tips. Ethiopia is very safe generally and robbery is very uncommon. However the largest denomination is the 100 birr note which is worth about $4. So this might mean that you are carrying large bundles of notes. Credit cards are starting to be accepted. There is currently only one map available, printed originally by the University of Berne in 1977. Most of the guides have photocopies. Occasionally these maps are available at the park office for $30. Most nights we have something going on in the lodge, vaying from either a film to an evening lecture. Trekking and camping provides several possibilities. If you are staying in the lodge at the beginning or the end of your trek then you can leave unwanted baggage with us so you can walk 'lightweight' for walking. You can hire donkeys and mule drivers. 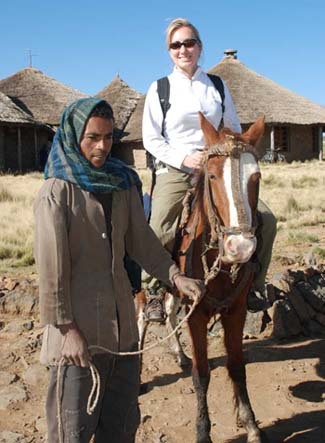 You can hire a horse to ride although Simien horses are smallish beasts and you might feel that you are abusing the unshod horse after a short while. The Simien people treat animals badly as a rule and tourists can help by education. At the lodge we have good new tents and sleeping bags. If you hire in Gonder or Debarak then be careful since most of the tents leak and the sleeping bags are thin. Our sleeping bags are rated to -5 and are properly cleaned after each trek. Please advise us in advance and list the number of tents, sleeping bags, mules, guide, etc that you require. There is a 'refuge' at Sankabur but it is not a lodge in the sense of Simien Lodge and we prefer that our guests do not use it except in the rainy season.The same applies to so called 'Community Lodges'. They are OK if you don't mind roughing it but they are not real lodges. Don't expect a shower or a proper toilet. Note: for clients staying at Simien Lodge, it is possible to leave unwanted luggage in our store. Beware of hiring used equipment in from places which do not specialise. The equipment is often poor quality and you could end up either very wet or very cold. It is possible to take either challenging or not too challenging routes from the lodge which last just half a day and either return to the lodge by foot or to walk further a field and get picked up by car in order to come back to the lodge for lunch (and if you are on a tight schedule to even return to Gonder that afternoon). The walk to Saddick Amba monastery takes about two hours to go down and three hours to climb back up the escarpment. It is one of the most beautiful treks in the Simiens. You can order a packed lunch from the kitchen and stock up on water and head out for the day. You can stay on the relatively flatter paths of go off the beaten track and try some of the more challenging hillier walks to nearby view points, waterfalls and villages and then walk back of get picked up by car. Every walk in the Simiens is a nature walk. But if youre keen on photography, beautiful landscape and sceneries, flora and fauna or wild-animals, you dont need to walk far from the lodge to be immersed in amazing examples of all of these. (In fact, you can sit on your sun-porch and watch it come to you.) But if you arent that patient then tailored walks can be done to encompass any of these aspects. You can find one of the nearby Gilada Packs and sit just metres away from these amazing animals or walk to spectacular viewpoints. 3 days leisurely trekking from Buit Ras (Simien Lodge) to Sankaber (5 Hours), Sankaber to Gich (6 Hours) and Gich to Chenek (7 hours) and get picked up by car. This can be made into a shorter or longer trip, as you can get picked up at the end of any day or could walk yet further into the park or make it into a 6 day trek if you walk back as well! Variations include staying at Gich Camp a few nights and doing some day walks around Gich escarpments to avoid having to increase in altitude any more. 2 Days more physical walking: from Buyat Ras to Gich (7 Hours) and Gich to Chenek (5 hours) and you can come back by car, or walk. You also have the opportunity to climb the highest mountain in Ethiopia - Ras Dashen. Although this could be done in 6 days from the lodge, we would advise taking longer over it unless you are properly acclimatised to these altitudes. Alternatively you can travel by car to Chunnuk camp or Bwahit and start trekking from there. From Bwahit it is a three day trek. From Bwahit you descend to the Mesheba river which takes about 4 hours through the village of Chiroleba. After the river at 2700m you climb to the camp which takes about 2 hours. The trek to the summit normally starts about 4am on the next day since the summit is often shrouded in cloud which comes later in the day. There is a long traverse through giant lobelia woods. The final 100 meters to the summit requires some rock climbing skills. There are a couple of parts which are steep. The same morning, the return to the camp is quite simple but the total walking time on this day is about 10/11 hours. The return to Bwahit the next day is perhaps the most tiring part of the three days. There is no radio communication, no search and rescue, no medical facilities on the far side of Bwahit. As a result of the altitude, the more popular way of trekking requires you to hire a scout, guide, cook, mules and mulers. Extra horses are available to take if you would like a back up in case it is harder in places than you had imagined. This allows you to concentrate on the good views and the enjoyable trekking, with tents, food and navigation being taken care of. Challenging trekking with your home on your back! If you are feeling fit, it is also possible to only hire a scout (who will know the way of the more popular treks, but may struggle more off the beaten track!) If you have a large enough rucksack then you can carry everything with you, but this should include food, water etc. To make this a viable option you will need to bring all of your trekking equipment with you from home as trekking equipment on hire here is not light-weight, it is brought with mules in mind! (Limited) food can be brought from Debark, but is more reliably brought from Gonder or Axum. Camping gas cylinders are available in Addis, or you can bring a multi-fuel or petrol stove with you instead and it is best to buy fuel in Gonder, although limited supplies of fuel are available in Debarke. The Horses in Ethiopia are not the same size as horses in Europe and tend to come up a little smaller, so although they are good as a back up, they are generally unable to carry heavy loads up or down the steeper of the hills. The equipment used here is somewhat rudimentary and as such is not as kind to the horses. The horses are not treated to such a good standard as the horses in Europe. Simien Lodge support international efforts regarding global warming and assisted with the planting of 7000 trees last rainy season.